Create a strategy with your investments that will help ensure you never run out of money. There are no do-overs in retirement. You need a path. You need a strategy. You need a guide you can trust. 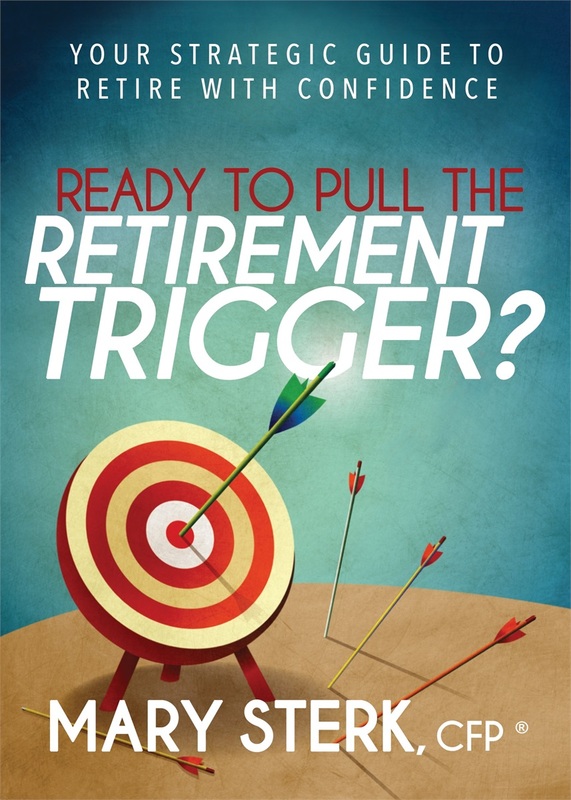 Ready To Pull the Retirement Trigger? will arm you with the essential knowledge to create a strategic plan so you can retire with confidence. You can order your copy from many bookstores including these - just click on the logo to take you there! In the book, we offer a Strategic Retirement Tool Kit to aid in your retirement planning. I found Ready To Pull The Retirement Trigger? to be an exceptional book that brings real clarity to the complex process of retiring. It is written in an easy-to-understand style and has clear steps to navigating this life-changing event that can be so daunting for many Americans. Mary’s personal stories will help readers fully understand the important connection between money and life. In this clear and straightforward gem of a book, readers find valuable information and tools to help allay their fears, discover their choices, and prepare for the retirement experience they desire. This is a fantastic book for anyone approaching retirement. It takes the complex and explains it in an easy-to-understand manner, providing action steps designed to help readers prepare for a successful retirement. Mary gets to the heart of the emotions all of us face when we’re considering the option of retirement. Not only is she sensitive to the feelings that can hinder sound decision-making, she provides clear steps and strategies for navigating the future. -Teresa B. Easler, CEO, Connect To The Core Inc. This book by Mary Sterk is so concrete in its advice for being “Ready To Pull The Retirement Trigger.” I think it is one of the clearest and most helpful books available on this subject. As more and more members of our generation reach this decision point, the advice here will be so very helpful. I know it is for me. It also has very helpful ideas for the clients I am advising who are considering retirement. This book is a great asset for those approaching retirement. It is not too long, and it is written for the reader who is starting at ground zero in retirement planning. It begins by asking all those questions that scare us about choosing to retire. And it provides a blueprint for answering the questions and planning for the future. It does so in clear and understandable terms for the beginner, and provides increasing confidence in your decision-making as you learn how to approach your new life style. Mary takes the future retiree on a learning journey with Action Steps along the way to summarize and provide an outline for what needs to be done. The complexities of budget-making and estimating future income needs are made simple. Providing for heirs, managing risk, choosing pension formats, health insurance, nursing home insurance, social security are all topics covered in a way that helps the reader to a new level of security and confidence in their planning. There is even a section on Medicare and how it works, a subject most of us know too little about, but one about which we are afraid to admit our ignorance. It’s all there, but it’s short, clear and designed to strengthen that shaky retirement trigger. Read this book, and you will be ready to prepare your strategies with confidence in your decisions. An engaging and informative read. Relatable anecdotes help drive home important lessons from money philosophy to planning and portfolio design. Definitely recommended for anyone who hopes for a stress-free retirement–next year or thirty years from now. Ready To Pull The Retirement Trigger? breaks down the entire retirement process into bite-size pieces that are easy to do. The book provides a clear, concise plan that not only takes the fear and uncertainty out of the retirement process, but frames it in such a way as to make it an enjoyable experience! Even though this is a book about retirement, Sterk’s plan is so helpful that it should be required reading for everyone, regardless of age. Third-party rankings and recognition are no guarantee of future investment success and do not ensure that a client or prospective client will experience a higher level of performance or results. These ratings should not be construed as an endorsement of the advisor by any client nor are they representative of any one client's evaluation.